Idea of India is the latest avatar of Communism. Indeed, if there’s one thing we need to give full credit to the Communists, it’s their ability to rapidly morph and coin innovative phrases according to changing times. As also their skill of appropriating leaders, icons, and ideas. From Swami Vivekananda in the East to Basavanna in the South, from Buddha and Ashoka in the ancient times to Ambedkar in our own time, they’ve clothed every reformer, saint, thinker, and political leader in Communist robes. They’ve dipped subjects as varied as history, religion and philosophy in Red paint. “Idea of India” is just the latest experiment in this tradition. This phrase seems to have come out of thin air about three or four years ago, and has now gained widespread currency, promoted among others by the Leftist academic, Ashutosh Varshney. A Google search for “idea of India” reveals that most of those who have waxed eloquent on this phrase are Communists. And each have their own unique prose styles to define and describe what it is but underneath, the boilerplate remains the same. 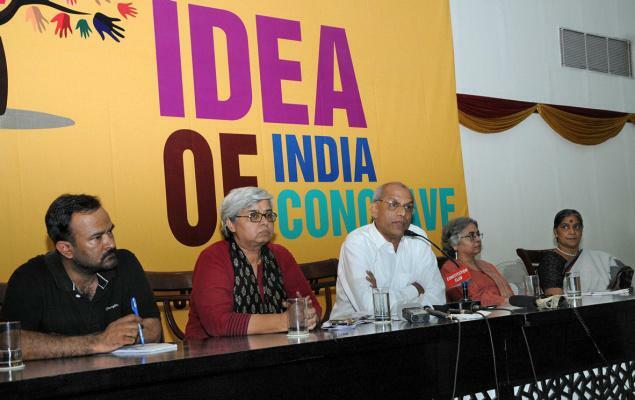 There have now been at least three “idea of India” conclaves. But perhaps the best description of “idea of India” comes from the club of the most vocal and the most rabid of its purveyors. After paying lip service to things like equality and the protection of the oppressed class, they really open the floodgates. The quoted text is derived from the invitation note to the latest “Idea of India” conclave that was held in Delhi on July 4 and 5, 2014. The conclusion of the note is revealing. In plain language, it simply says: let us collectively and relentlessly fight against Narendra Modi. The dramatis personae wielding the reins of this conclave are familiar Modi-baiters with varying degrees of hatred against the Prime Minister. They’re also the ones who hounded Modi relentlessly for a decade. Prominent names include Teesta Setalvad, Harsh Mander, Anand Patwardhan, Shabnam Hashmi, John Dayal, Kancha Ilaiah, Mallika Sarabhai, and Ram Puniyani. The original list also included Girish Karnad, Romila Thapar and Mahesh Bhatt among others. Two aspects are quite illustrative. First is the fact that it took them so long to organize this conclave—May 2014 to July 2014 is quite a long time. Given the precedent in such cases, such conclaves would have begun almost the day after the election results announcing a BJP victory were announced. The reasons could be several but it’s clear that the “idea of India” bourgeoisies have realized that things have definitely changed, and that a post-Congress India has truly arrived. Let’s not forget the fact that all of these names were incredibly powerful until May 2014, and in a single stroke, the tables have turned and how! At least this is what the Hindu wants us to believe. Indeed, the “rare” unity is not at all rare. All these activists and their ilk were always bound by two subterranean unifying threads: the communist ideology and loyalty to the Congress party. Every single eminence at the conclave is a beneficiary of the Congress largesse which has helped them build their careers, reputations and wealth. the “Modi model of development”, which filmmaker Anand Patwardhan termed as “the most dangerous project” India has ever seen. Mallika Sarabhai told fellow activists that “there is no need to mourn further on the failure of secular forces in the recent election. It is not good enough to sit here and mourn about it and remember the past”. Why doesn’t it occur to Mallika Sarabhai that Narendra Modi’s massive victory is actually the success of secular forces? Shabnam Hashmi, the arch-Modi baiter forgets is that the “political opposition” she refers to—the Congress party, has not even qualified to be LoP in the Parliament. It further faces a May 2014-like fate in the upcoming assembly elections in Maharashtra and Haryana. Thinking about some “idea of India” is the last thing on the mind of the Congress party. And in the process, openly admits which gravy train she has been on all this while. In every decent society, conflict is prevented and/or contained. Tehmina Arora not only advocates the opposite, but encourages conflict. A society needs to encourage a debate of ideas, even conflicting ideas and not conflict as an end in itself. But then she has been the honest of all: Communists in non-Communist nations have always manufactured, seeded and encouraged conflict at every level and in every sphere of human activity. And where Communists are in power, the word “conflict” is erased from the lexicon. This then is the chief component of the “idea of India.” And this is what the conclave endeavoured to defend. But for all their lofty pretensions, in the end, there’s exactly one idea that the Idea of India bourgeoisies were defending: the Congress party’s idea of India.